WHAT ARE THE MAJOR HAND CHARACTERISTICS IN DIABETES MELLITUS? Diabetes mellitus is a relatively common condition and is frequently encountered in patients seen by hand surgeons. This review examines the known problems associated with diabetes, as well as some of the clinical findings noted in these patients, who often have multiple visits for hand conditions over time. In general one can say that 'joint limitations' & 'skin thickenings' are the major typical signs in diabetes mellitus (this appears to count for both adults & children, and for both the insuline dependent- and independent types). The 'Preacher's sign': the hands of two patients with diabetes mellitus and the diabetic hand syndrome. The patients are attempting to fully appose the palms and fingers. The patient on the left illustrates moderate limitation. The patient on the right has significant impairment. great article(s), thanks for posting Martijn. I have looked for a long time about signs of diabetes in hands. Great to see that the articles are usefull for you both! ...thank you Martijn, interesting and helpful. The study describes that Md15* (a fingerprint ridge count measure on the thumbs minus the ridge count of the pinky fingers) correlates positive with diabetes. The results of this study indicate that a very high 'fingerprint ridge count' on the thumb (for example a large whorl) combined with a very low 'fingerprint ridge count' on the pinky finger (for example an arch pattern) ... is a RISK FACTOR related to diabetes. But of course, remember: one risk factor in isolation... means hardly anything!! So, one really has to find other related risk factors, before one can describe it as a risk factor, etc. ... but there are many other studies available. I the (near) future I will try to present an overview of the most significant dermatoglyphic markers in the perspective of various types of diabetes. In those with diabetes, the line joined a second line at a wider angle and at a point 1cm higher in the palm. Is there a picture of what this looks like? I can't visualize what it would look like. I read in the book of Eugene Scheimann, MD that muscle shrinking may occur in several diseases, sometimes before other symptoms appear. In every one out of four of diabetics show muscle shrinking starts appearing on their hands frequently, at the space at back of the hand between the thumb and the index finger much before the usual symptoms of diabetic mellitus. I have found it correct. Actually... I have wondering about exactly the same question. And I have been looking to find the title of the report, but unfortunately I was not able to find more details about that study. I can't find any related info at all beyond that bbc report. Martijn (admin) wrote: [quote=Actually... I have wondering about exactly the same question. And I have been looking to find the title of the report, but unfortunately I was not able to find more details about that study. I can't find any related info at all beyond that bbc report. I have attempted to contact Professor Bernard Richards who discovered the correlation between the life line and secondary line with diabetes. I will let you know if I hear back from him. ...HOW CAN ONE RECOGNIZE 'MUSCLE ATROPHY' - at an early stage??? Actually, I the 'preachers sign' might be one of those related characteristics!! (Diminished hand strength and diminished joint mobility are other related aspects). PS. But one should also be aware that especially at higher ages hand muscle atrophy can have many other causes (aging might be related as well). So obviously, recognizing diabetes via the hands only ... require the ability to recognize multiple related signs!! One single 'sign'... means nothing!! Lori wrote: I have attempted to contact Professor Bernard Richards who discovered the correlation between the life line and secondary line with diabetes. I will let you know if I hear back from him. well done Lori, thanks! Hope you get a response that will help us understand the lines in question. Though hand infections appear not much higher than in the normal population, the severity of the symptoms can provide a signal. 33 Hand markers in Diabetes Mellitus! I think that diabetes can in many cases be assessed from the hand, but it does require to analyse the hand from multiple points of view... the new article describes the most essential aspects of the hands (according scientific studies) for 7 'perspectives'. NOTICE: The simian line is not a major marker in diabetes, but far most studies found that it IS more often seen among diabetic populations than in the general population...! Hi Jeanette, thanks for your feedback. Additionally, I would like to advice (again) to pay some attention on studying the significance of the so-called 'prayer sign' or 'preacher sign' - because the statistics in the studies have revealed that it is clearly one of the most significant sign in diabetes mellitus (in both the insuline dependent variant AND the non-insuline dependent variant); see also the 2 illustrations below. Hy Lynn, - out of topic - but you are online: Sunny greetings from the Whitsundays' coast. Although probably not related to diabetes, Dupuytrens contracture causes an abnormal stiffening of the fingers, the ring finger in particular. The finger becomes stiff and cannot bend properly. This is due to a ligament contraction. It can be relieved with surgery but not cured as such that way. My doctor is the only person I know who has a cure for it. He uses electrical stimulation in an acupuncture like manner to free the finger. In a palm print it can be seen like something pulling the skin ridges down not far below the ring finger. It is supposed to be most common in older males of Viking descent. Incidentally can I insert a picture in this text box? 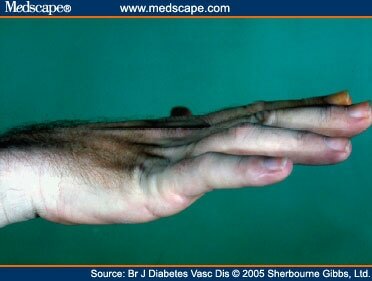 Dupuytren’s contracture is a disorder of the hand that is more common amongst people with diabetes. The first sign is often a tender nodule (a small bump) in the palm, near the base of the fingers. It progresses slowly and usually painlessly to cause the fingers to bend inwards towards the palm, so you can no longer fully open your hand.